Discussions regarding the reliability of locomotive-hauled trains on the Cumbrian Coast are ongoing, with no decision made as to their replacements. There had been suggestions that Direct Rail Services would supply top-and-tail Class 68s to replace the Class 37/4s on the route. The ‘37s’ operate in push-pull mode with Driving Brake Standard Opens, but there have been several failures, caused by both the locomotive and the DBSO. DRS is contracted to supply Northern with two sets of locomotives and coaches until January 6 2019, the deal having started in 2015 as part of a Department for Transport-funded scheme to cover for a cascade in diesel multiple units (RAIL 767). 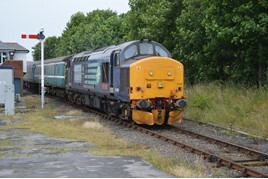 Currently DRS has allocated 37401-403/424/425 to the XHCC pool for Cumbrian Coast services. To read more on this, read RAIL 844, published on January 17, and available on Android/iPad from January 13. With the Blackpool - Preston line closed until May Northern should have DMU's to spare. Why have a couple of sets as hot spares ready to go. Or T+T with 37's (I thought Harry Needle had re-worked them) if there's enough of them. Northern probably wouldn't like the extra cost though.